The winter winds shriek and moan around the castle turrets as the nightmare finds him, poor cat-boy John. He runs from room to room until he finds a place to hide, and then he hears but two things: the clattering and the ragged hish, hish of his own breath." Can you say "atmospheric?" This takes place is a Scottish castle, whose corridors are maze-like. The weather is suitably Scottish (a.k.a. foul), and sinister things are afoot. What's left of my hair positively curled, as I read along. Kat Bateson is an independent, skeptical child. She's given a chatelaine by her great-aunt, and told by said great-aunt that the chatelaine is magic. Rational Kat, however, doesn't believe in magic. That is, until the horrors of Rookskill Castle unfold. Speaking of sinister, Lady Craig--referred to as "the Lady"--is one of the creepiest creations of children's literature. She is a soul-stealer, with a chatelaine of her own, and Kat and her younger siblings are her targets. I loved the way the novel shifted effortlessly between time periods--from the 1740s to the 1860s to the 1940s. The writer got all the period details just right. Janet Fox isn't British, but she sure fooled me (someone who's a Brit by birth.) Her feel for British language and idiom was superb. If I ever have the honor to meet her, I'll have to ask her how she does it! Oh, boy. Where do I start? (Where do I end?) I started to answer this and the list got so, so long...let's just say I hate to miss any of my favorites. 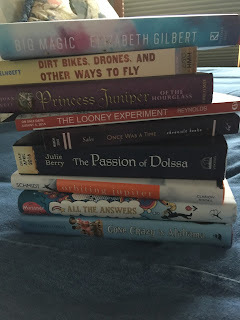 Let's just add that I love middle grade. And there are so many fabulous middle grade authors and books out there right now. But I'll say this much: I dedicated THE CHARMED CHILDREN OF ROOKSKILL CASTLE to Kathi Appelt. Not only has she been a friend and mentor, but I turn to her books (especially THE UNDERNEATH) for gorgeous language, great character, and richly layered plot. 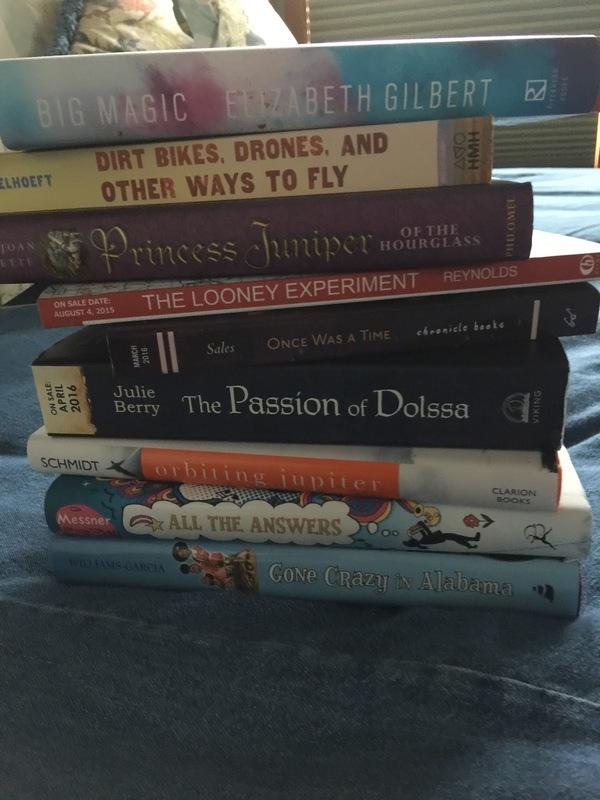 Since a picture is worth a thousand words, I'm attaching a photo of my towering pile, which is just where it starts. bacon and eggs. With blueberries and yogurt. And strong, strong coffee. And, if I'm really indulging, a chocolate croissant, warmed up a bit so the chocolate is melty. Yum. Janet Fox writes award-winning fiction and non-fiction for children of all ages. Her published works include the non-fiction GET ORGANISED WITHOUT LOSING IT (Free Spirit, 2006) and the YA historical romances FAITHFUL (Penguin 2010), FORGIVEN (Penguin 2011), and SIRENS (Penguin, 2012). 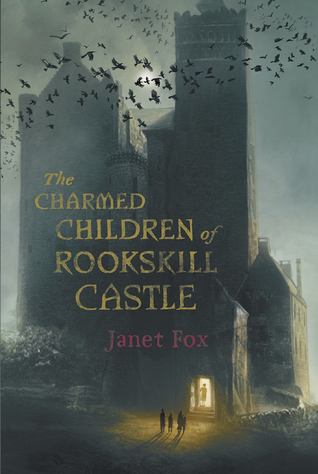 Her debut middle grade novel, THE CHARMED CHILDREN OF ROOKSKILL CASTLE is a historical fantasy set in 1940 Scotland. Janet is a 2010 graduate of Vermont College's MFA in Writing for Children and Young Adults. She lives in Bozeman, Montana. Well folks, that was a fun book to review on my birthday! Off to celebrate. Ciao! Preamble: I'm writing this on Sunday afternoon, befuddled by Daylight Saving's time and peeved by the fact that my laptop's hard drive died this morning. I wish the Don could just take over the world, and decree an end of DST as well as mechanical malfunctions. I was on the verge of going off to sulk when I realized the old and barely used computer downstairs was still chugging along--and I had received some wonderful answers this week to my questions from Dianne Salerni. This immediately put me in a better mood, and hence you have an MMGM from me today. Huzzah! The battle between Kin and Transitioners that's been brewing for centuries has finally come to a head. The sinister Kin have captured Evangeline's younger sister, Addie, a descendant of Merlin whose presence will allow them to reverse the Eighth Day Spell and free themselves. Addie doesn't realize the full consequences of her cooperation. She's been helping the Kin because they value the strength of her magic—something Evangeline never did. The feeling of power coursing through her veins is impossible to resist. "Normally, Addie Emrys didn't like heights, but in this case, the view was worth it. Leaning on the wooden railing of a second-floor balcony, she watched waves crash against rocks on the shore below, blasting themselves into wild sprays of foam." The Cover, right? I love all the covers of this trilogy, by artist Mike Heath. They are eye-catching and arresting. If you want to see how to deftly introduce a new book in a series, study Dianne Salerni. There's no massive info dumping. Instead, the story starts off at speed, with occasional reminders of what has gone before. Brilliant! In every book of this trilogy, Dianne has had some breathtaking, climactic fight scene. 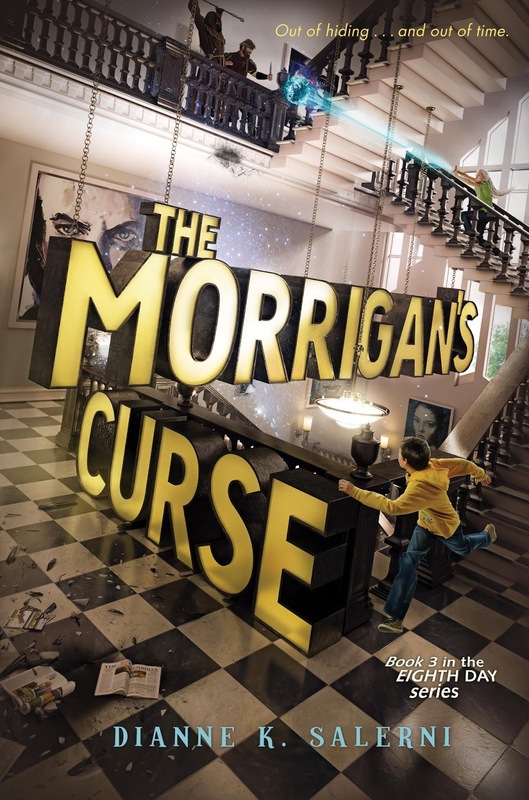 The Morrigan's Curse is no exception. This time, it's Addie, with her fear of heights, having to do battle on top of a water tank. It gives me goose bumps just thinking of it. Dianne Salerni is a master. 1) What's the hardest thing about writing a series? 2) Is the Morrigan a real legend, or did she spring from your imagination fully formed? The Morrigan is a real mythological character -- or as real as any mythological character can be! She is known as a 3-in-one deity linked to fate, war, and destruction. For my book, I took the barebones of her legend and refined them to serve my story, giving unique names to each of her incarnations: the Girl of Crows, the Washer Woman, and the Old Crone. 3) Will there be a book 4? My favorite thing about book signings is when a young reader comes having already read one or more of my books and has a long list of questions to ask me about the plot. Sometimes I have to think on my feet when they start digging deep into the story! Thanks for featuring me at Middle Grade Mafioso! Thanks for creating such a great story-world, Dianne. I hope we all get to read more about Jax, Riley, Evangeline, and the rest of the cast soon! You can read my Middle Grade Mafioso reviews of The Eighth Day and The Inquisitor's Mark, as well as visit Dianne at her web page and follow her on Twitter. Ciao!